I don't think I've ever seen such split opinions on a game like Resident Evil 6. 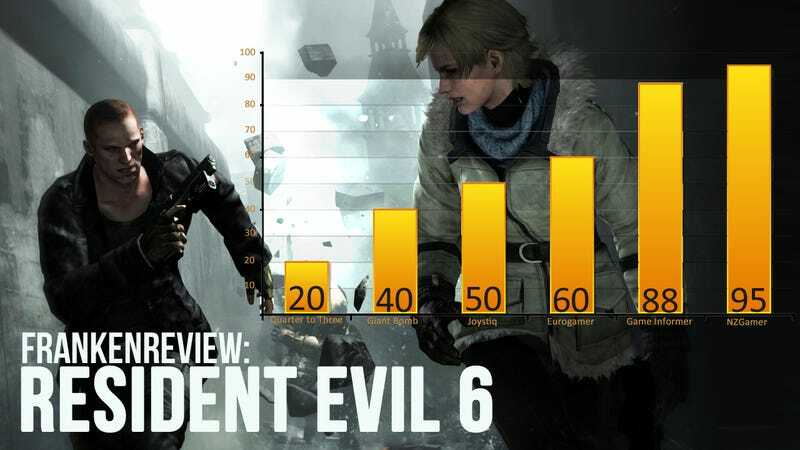 Though one opinion seems to generally resonate: Resident Evil 6 is, at least, very flawed. It's an ambitious project that offers multiple campaign paths, and even a few fun quirks, but mentions of clueless design on par with Raccoon City run rampant in several critics' reviews. Sure, there are over-the-top moments for you action junkies and some really interesting multiplayer features, but does that forgive its faults? Some of these reviewers think they're negligible. Others, not so much. Yes, this is just like Raccoon City all over again: stilted, awkward, ridiculous, embarrassing, tedious. Except for the parts where it's like Call of Duty, which are equally stilted, awkward, ridiculous, embarrassing, and tedious, but with more NPC soldiers milling about. Resident Evil 6 is thoroughly oblivious to so many of the things that make a good game these days. At a glance, Resident Evil 6 is built on the basic blueprint of a good action game, swaddled in what must have been one of the most expensive productions in video game history. You could offer a lot of ifs about how to make this game better: if the fat were trimmed out in service of a shorter, tighter campaign; if the designers had drilled down more intently on one style of gameplay rather than trying to cover all of them; if the player's core interactions with the game were simply as refined as they should have been. But in the real world, we're left with what's in the box. It's hard to fathom how Resident Evil, which almost singlehandedly redefined the action genre just two installments ago, has now become such a strange, mediocre pastiche of the better games this series once inspired. What a bitter irony that is. The problem isn't that Resident Evil is changing direction over time. No, it wants to go in all directions at once. It wants the creeping pace and the hectic shootouts, and the blockbuster set pieces, the vehicle chases, the resource management, the hand-to-hand combat, the online co-op, the drama, and the extravagant boss fights. You might not fault Resident Evil 6 for its attempt to be an action game for all, but there's no choice but to speak up when the overall result feels unpolished and scatterbrained. It's chaos. The game represents a tremendous amount of effort and investment and, for those impressed by such things, Resident Evil 6 may delight. But all the effort in the world won't make up for a lack of vision. This game is blind to imagination and focus. Capcom's uncertainty about the series' identity post-Mikami (and post-Uncharted) is hardcoded into its structure: four campaigns offering different, flawed expressions of that potential. And the inevitable price for this wavering is a lack of coherence. Resident Evil 6 is an unwieldy tribute to the series' past, an uneven expression of its present and an unwelcome indication of its future. Over the years, the tone of the Resident Evil series has morphed from a George Romero horror flick to Michael Bay summer blockbuster. That metamorphosis into insane action is front and center in Resident Evil 6, and bringing a buddy along for the chaos is great fun. The game's minor flaws don't hold back the decadent experience from being an unhinged, flaming rollercoaster ride. Something that's painfully obvious from the moment you load up RE6 is that Capcom are trying something new here; there are changes to almost everything fans of the series may hold dear - even the classic Resident Evil pre-menu screen. The enemy types are new, there are some new characters, and there are some new villains; none of this is a bad thing. The only things that needs to be toned down are the QTE sequences. Yes, everyone is doing them, and they've been in the series since RE4, but it can be incredibly frustrating to trial-and-error your way through a whole scene because of them. If you were left wanting in RE5 there's a good chance RE6 will satisfy you. There's a reason you're being fired at, there are plenty of tense moments and stress, the storytelling is superb, and "zombies" make a return. Resident Evil 6 isn't perfect but it's still a game that everyone should own. Mutation gets a bad rap. It's a necessary part of evolving into a newer, more capable lifeform. Without mutation , human beings wouldn't have opposable thumbs, for example. But mutation can also twist organisms into horribly gross or not terribly useful shapes. Unfortunately, It's clear that what's happened with the Resident Evil franchise. Every intriguing design possibility in the game-the way it shifts to stealth, hand-to-hand combat or environmental puzzles-is something cribbed off of a better implementation elsewhere. Resident Evil 6 feels like a ton of gene-splicing has been happening in Capcom's dev studios and the result isn't a miracle cure for what ails the franchise. Instead, it's a misshapen hunchback filled with bad DNA. You could try killing it with fire, but it will probably come back.